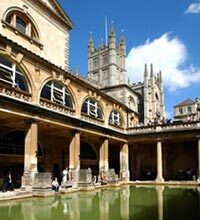 Stonehenge, Baths Pump Rooms, Windsor castle. Crossing the Salisbury Plain in the South West of England, to see the 11th Century Windsor castle. As you proceed towards Stonehenge, the temple suddenly appear in the distance: standing alone proud and gigantic in the middle of the Wiltshire countryside. It sends out an irresistible and overwelming sense of mystery. Stonehenge is a referral point for the followers of astrology, of the solar movements, of the partial eclipses and on the special occasion of the 21st June, the area is attracting big crowds of various cults and New Age travellers who gather here and try out the strength of the electromagnetic field. A place for meditation, archaeological studies, contemplation for points of magnetic conjunctions and extraordinary feelings. At the entrance, two 7 feet high stones welcome you with an invitation to touch them for your own personal and natural contacts with the past. A Strong emotion is caused by the sight of this mysterious and prehistoric place with its intriguing and ancient history. Windsor castle: a picture is worth a thousand words. . Extraordinary visit to the megalithic temple and continuing across the river Avon to Bath, one plunges back into the 1st. Century.